Lowest Price Online: $4755.00 ? 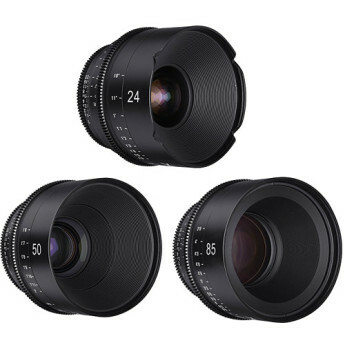 Rokinon's Xeen 24, 50, 85mm T1.5 Lenses for Sony E Mount are built specifically for use as a cinema lenses. They feature an internal focus design, so the lens does not change size while focusing; this minimizes the appearance of breathing when changing focus. Each lens in the set is multi-coated for good contrast, glare prevention, and color-match to a factory standard allowing you to assemble a set over time with minimal color shift. Consistent gear positions and front diameters make lens swaps quick, requiring minimal readjustment. The 24mm lens provides what is considered a wide-angle of view on full-frame cameras and a tighter angle of view on smaller formats. The 50mm lens provides what is considered a normal angle of view on full-frame cameras and a tighter angle of view on smaller formats. And the 85mm focal length is often chosen for portraits and close-ups.